In 1915, a photographer by the name of Lewis Wickes Hine passed through Fort Collins and took several photographs during his stay. He was primarily documenting stories of child labor. (His photographs proved to be instrumental in getting child labor laws changed in the U.S.) In Fort Collins and northern Colorado he was mainly interested in the children who worked in the beet fields. One family that he documented lived in town 6 months out of the year. But for the other six months they boarded up their city house and lived in a shack closer to the beet fields where they worked. (You can see a picture of the family in the Second Hoeing book review — about half way through the article.) They worked long, hard hours during the beet season and couldn’t spare the time or energy it took to travel back and forth between house and field. What intrigued me when I was looking through Hines photos was that I knew the city house where this family lived. 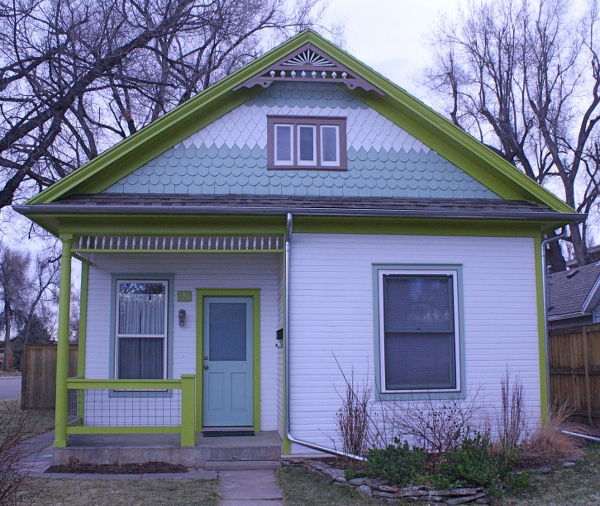 I walk by it frequently and have often admired the style and detailing on the house. I knew immediately that it would make for an interesting Then & Now comparison. The image at top was taken in 1915 and is on file with the Library of Congress. The photo at bottom was taken on July 1, 2016 and isn’t at quite the same angle due to a large tree in the neighbor’s lawn. Though there are a few difference between the 1915 version of the house and the present day, it appears to have retained an incredible amount of integrity over the years. Differences include the replacement of a small chimney in the back with a metal exhaust pipe, the removal of the finial that ran the length of the roof, and the replacement of the wood rungs along the porch railing with what looks to be metal or wire mesh. There used to be a rounded piece at the top of the porch railing post and the post itself was round. That was replaced by a square post with a flat top. 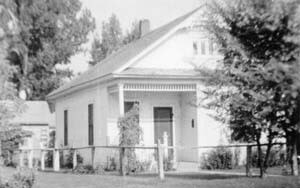 It’s possible the windows have also been replaced, although it’s hard to tell given that the windows in 1915 were boarded up while the family was away in the beet fields. The house at 430 N. Loomis. The fence in the photo from 1948 looks similar to what was there in 1915. Note that the post on the porch railing still had the rounded bit at top in this photo. There’s a new metal fence in 1968 along with the loss of the rounded bit on the porch post. It’s hard to tell if the roof top finial is still in place in either of these County Assessor photos. It’s possible that was lost fairly early on. 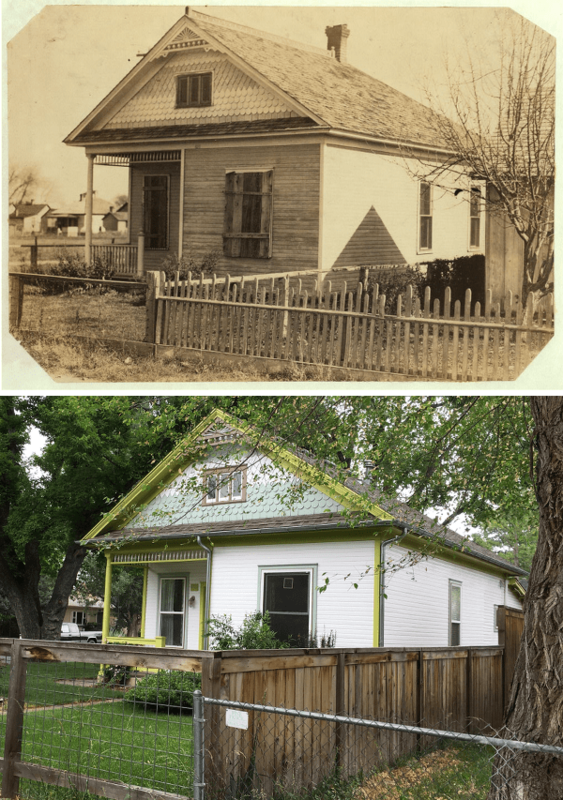 This house is not listed on the Fort Collins register of landmarked properties, although it’s clear that the current owners appreciate and are maintaining the beautiful original detailing as well as the overall form of the house. This is a wonderful example of a small house that was affordable for someone of simple means, but that still showed pride of place. 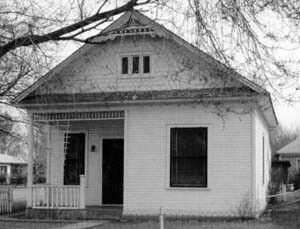 Thanks to the loving care it has received over the past 100 years, this house remains a gem along N. Loomis.